Superyacht swimming pools represent the ultimate spot for on-board relaxation and some of the world’s biggest yacht builders have taken novel approaches to this challenge. We take a closer look at some of the finest examples starting with 74.5 metre Elandess... 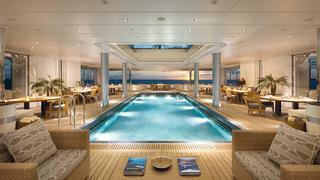 The eight metre sundeck pool contains 22 tonnes of fresh water warmed via waste heat recovery. It has a glass wall for watching grandchildren at play, and a skylight at the bottom which sits above the main staircase. Elandess won four gongs at the Boat International Design and Innovation Awards 2019 and was delivered in 2018 by Abeking and Rasmussen with exterior and interior design by Harrison Eidsgaard. 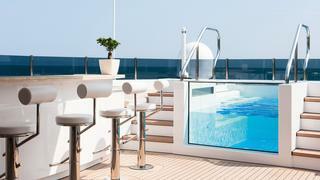 The eight metre sundeck pool contains 22 tonnes of fresh water warmed via waste heat recovery. It has a glass wall for watching grandchildren at play, and a skylight at the bottom which sits above the main staircase. Elandess won four gongs at the Boat International Design and Innovation Awards 2019 and was delivered in 2018 by Abeking and Rasmussen with exterior and interior design by Harrison Eidsgaard. 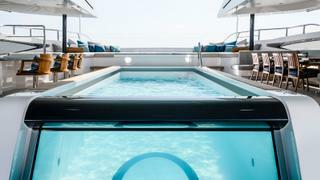 Next up is the main deck swimming pool on board 83 metre Here Comes The Sun… Easy to access, this long and shallow pool ends with a swim-up superyacht bar — one of the main attractions of the first Amels Limited Editions 272 yacht, which was delivered to her Beatles-loving owner in early 2017. Easy to access, this long and shallow pool ends with a swim-up superyacht bar — one of the main attractions of the first Amels Limited Editions 272 yacht, which was delivered to her Beatles-loving owner in early 2017. With a glass bottom and glass panels, the pool on the first Sanlorenzo 52 Steel yacht Seven Sins plays with transparencies, creating a spectacular effect in the superyacht beach club below. Styled inside and out by Officina Italiana Design, Seven Sins was launched in January 2017 and is the largest yacht from Sanlorenzo to date. With a glass bottom and glass panels, the pool on the first Sanlorenzo 52 Steel yacht Seven Sins plays with transparencies, creating a spectacular effect in the superyacht beach club below. Styled inside and out by Officina Italiana Design, Seven Sins was launched in January 2017 and is the largest yacht from Sanlorenzo to date. 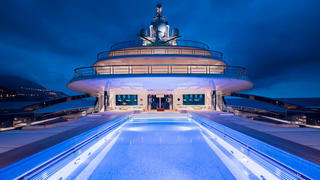 At the heart of the entertainment on the top deck, both the swimming pool and the spa pool on the 95 metre Lürssen superyacht Kismet are kept at the perfect temperature thanks to a generator heat-recovery system. 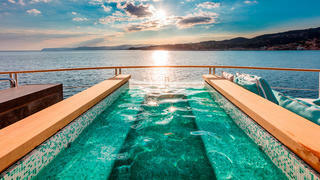 As if that wasn’t enough, there are two further pools in Kismet’s spectacular superyacht spa, including a plunge pool for a refreshing dip after a spell in the hammam. At the heart of the entertainment on the top deck, both the swimming pool and the spa pool on the 95 metre Lürssen superyacht Kismet are kept at the perfect temperature thanks to a generator heat-recovery system. As if that wasn’t enough, there are two further pools in Kismet’s spectacular superyacht spa, including a plunge pool for a refreshing dip after a spell in the hammam. The deep pool on the main deck of the 74 metre CRN custom yacht Cloud 9 contains 10,000 litres of water projecting wave patterns into the beach club below it. The swimming pool also had an influence on the interior styling by British studio Winch Design — a 1.5 metre deep lie-down sofa can be found in the adjacent saloon, which is ideal for relaxing after doing a couple of lengths. The deep pool on the main deck of the 74 metre CRN custom yacht Cloud 9 contains 10,000 litres of water projecting wave patterns into the beach club below it. The swimming pool also had an influence on the interior styling by British studio Winch Design — a 1.5 metre deep lie-down sofa can be found in the adjacent saloon, which is ideal for relaxing after doing a couple of lengths. The large superyacht swimming pool on board the 74 metre Amels Limited Editions 242 yacht Plvs Vltra was one of the owner's most important requirements. A counter-current system allows guests to get a proper workout, while the adjacent sunloungers and bar area ensure there's plenty of room for unwinding after a serious swim. When Feadship teamed up with CG Design to create Savannah there was a real focus on fine details, and the swimming pool is a great example of this with an intricate mosaic pattern created on the bottom. Flanked by sunpads and a massive C-shaped wrap of seating, this is an ideal spot to soak up some sun. 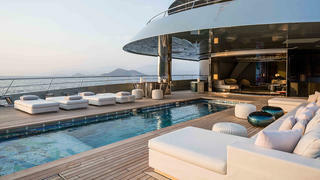 The aft deck pool on 69 metre Tankoa superyacht Suerte is particularly impressive. Fed by a waterfall, it holds 8,000 litres of water and features a swim-up cocktail bar so your guests can have their glass topped up without having to get out of the water. Glass panels in the base allow light to filter through to the saloon below. 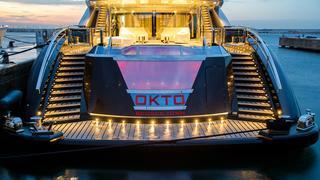 The sublimely silent 66 metre ISA superyacht Okto has a real party piece — a superyacht swimming pool that can change colour. 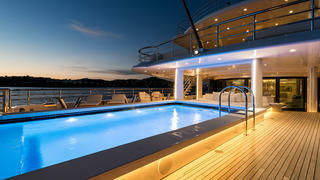 Measuring 6.5 metres by 4.5 metres, this aft-deck pool features underwater lighting that can switch from blue to red to green at the touch of a button, and a large pane of glass above the name plate means that those relaxing on the bathing platform can also appreciate this stunning effect. Heesen Yachts’ 70 metre flagship superyacht Galactica Super Nova, which was launched in 2016, boasts a large jet stream infinity pool ideal for swimming laps with a waterfall flowing down from the upper deck. The waterfall feature isn’t just good looking but creates an opaque screen that can be used for projecting films onto. Heesen Yachts’ 70 metre flagship superyacht Galactica Super Nova, which was launched in 2016, boasts a large jet stream infinity pool ideal for swimming laps with a waterfall flowing down from the upper deck. The waterfall feature isn’t just good looking but creates an opaque screen that can be used for projecting films onto. 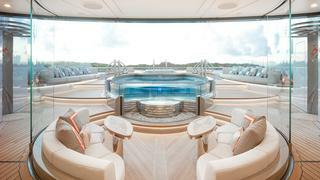 One of the most impressive superyacht pools is on Feadship's contemporary masterpiece Moon Sand. At six metres long and two metres wide, this pool contains 9,000 litres of water and has a contra flow system, allowing her owner to really swim. But what really caught our eye is the adjustable floor that can be raised or lowered, making Moon Sand's pool both safe for children to splash around in and one that suits adults. Furthermore, this luxury yacht pool doesn't need to be constantly emptied and re-filled because it can be closed by covering it with the teak floor, which makes it invisible. 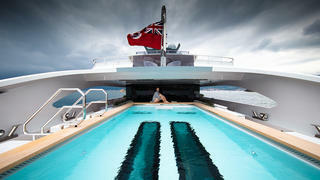 One of the most impressive superyacht pools is on Feadship's contemporary masterpiece Moon Sand. At six metres long and two metres wide, this pool contains 9,000 litres of water and has a contra flow system, allowing her owner to really swim. But what really caught our eye is the adjustable floor that can be raised or lowered, making Moon Sand's pool both safe for children to splash around in and one that suits adults. 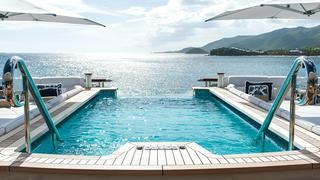 Furthermore, this luxury yacht pool doesn't need to be constantly emptied and re-filled because it can be closed by covering it with the teak floor, which makes it invisible. The aft of the sun deck is one of the most popular locations for fitting a superyacht pool and this picture of 40 metre Mondomarine Serenity shows exactly why. Stunning views out to sea above and below the surface are only broken by a slender grab rail, while the shimmering Bisazza blue tiles match nicely with the adjacent sun pad cushions. The aft of the sun deck is one of the most popular locations for fitting a superyacht pool and this picture of 40 metre MondomarineSerenity shows exactly why. Stunning views out to sea above and below the surface are only broken by a slender grab rail, while the shimmering Bisazza blue tiles match nicely with the adjacent sun pad cushions. Five years before Heesen revealed Galactica Super Nova, the concept of a superyacht pool with a waterfall was already proven on board the 55 metre yacht Quite Essential, previously known as Quinta Essentia. 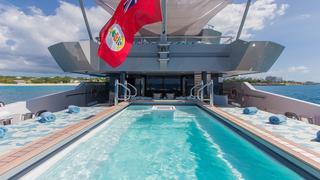 This opaque sheet of water falls into the spa pool, providing added privacy on the main deck when moored stern-to in port. Five years before Heesen revealed Galactica Super Nova, the concept of a superyacht pool with a waterfall was already proven on board the 55 metre yacht Quite Essential, previously known as Quinta Essentia. 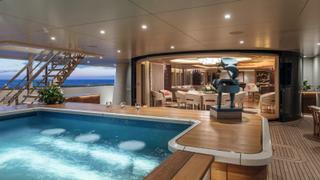 This opaque sheet of water falls into the spa pool, providing added privacy on the main deck when moored stern-to in port. 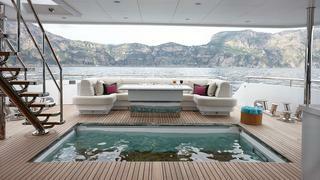 The swimming pool on superyacht Elysian is simply spectacular. 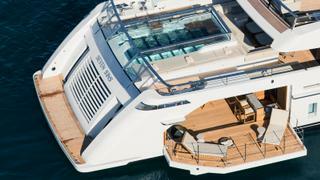 Located on the aft deck, it spans two levels with a shallow end and a swim-up seat. Surrounded by sunpads, this is one of the best swimming pools we’ve seen as it allows parents to soak up the sun while keeping a watchful eye on any young swimmers. We also love this pool because it looks very cool. The water forms a waterfall down the front of the transom, running into teak grates below. 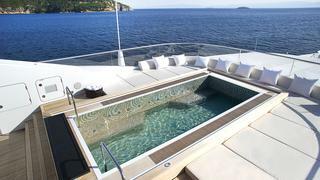 The pool on Sunrise's luxury yacht Irimari is worthy of inclusion in our collection of the best superyacht pools. Located forward on the sun deck, our favourite feature is the glass wall that faces the bar, although anyone swimming is guaranteed fantastic views as the pool lines up with the very front of the yacht. 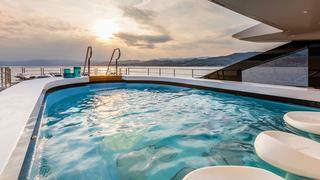 The spectacular 15 metre pool aboard the Terence Disdale-designed Eclipse features a bottom that raises to create a paddling pool, or lifts to turn the area into a dance floor. Is there anything it can’t do, in fact? 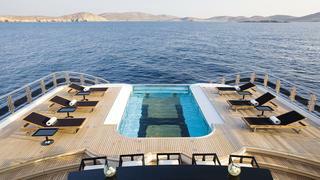 Its transforming properties makes superyacht Eclipse's pool one of the best. 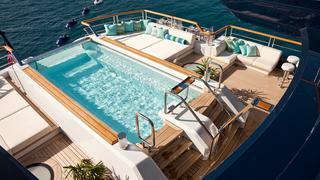 Quattroelle, has one of the best superyacht pools. 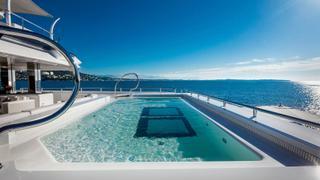 Step up and then step in to the infinity pool on the bridge deck of this Lürssen superyacht. With just a lip of glass keeping the water – and you – contained, it feels as if one could float off into the distance. Few other boats have dedicated so much space to sun worshipping. Luna’s long, elegant trail away deck offers a vast pool — one of the best found on a superyacht — and an even vaster deck for sitting and soaking up the sun. After you have visited Solandge’s sauna, steam room, massage room and gym, a few smug laps in the adjacent glass-backed pool will show off your toned physique in style. 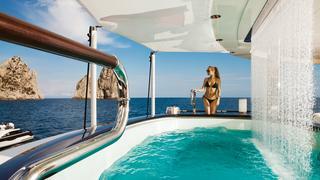 This is truly one of the best superyacht pools and spa havens to be found. You all know what the H stands for. Yes, the bottom of Alfa Nero’s pool rises up to create a helicopter landing pad, flush with the deck. It’s got a built-in current and incredible views too. The iconic yacht Alfa Nero is oft-credited as the first yacht to embrace the infinity pool, and even years after its launch, Alfa Nero's pool still ranks among the best. The pool aboard H2-designed Vicky sits on its own terrace at the front of her sun deck, making this one of the most private and best superyacht pools around. Wraparound sunpads mean you can go from water to sunning with drink in hand in two seconds flat.